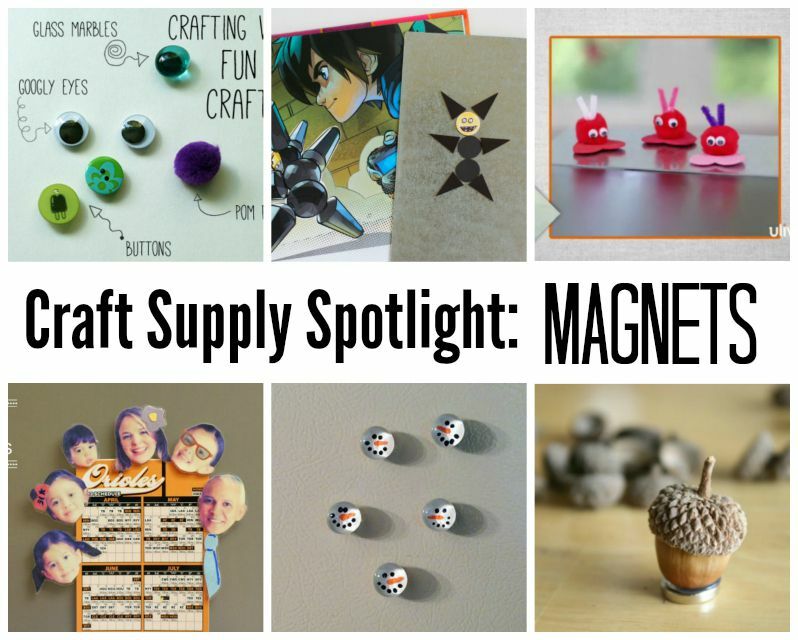 Magnets make their way into many school science projects, but you can also turn them into a base for decorative crafts. Available in craft stores, hardware stores and online, magnets come in all sizes, shapes, and strengths, including sheets you can custom cut to fit your project. Kids love to experiment with the attractive qualities of magnets, and their young hands are still developing their fine motor skills generally find the sturdy material easy to use. We have a few ideas to get you started but don't be afraid to let your creativity kick in and come up with some others on your own. Use hot glue to adhere the embellishments or plain white school glue to eliminate any risk of burns. When you mix magnets with ordinary craft supplies, you get fun and silly magnets for the fridge. So fire up the hot glue gun, make a mound of mixed media—think pom poms, buttons, googly eyes, pipe cleaners, felt or foam cutouts, little charms, feathers, sequins, and other glitzy odds and ends—and put your imagination to work. Bring the action from the movie Big Hero 6 home with magnetic Big Hero 6 Megabots. These interchangeable shapes come from a sheet and can be mixed and matched to look like the Megabots from the movie. Turn the bottom half of your fridge door into a screen where your kid can recreate scenes from the film and make up new storylines. How cute are these little Pom Pom Love Bugs? Add a magnet to their feet so they can hang out on your fridge or a child's school locker. These make great gifts for your children's school friends on Valentine's Day, and they look especially adorable in groups. For a fun Father's Day gift, take a silly picture of everyone in the family and turn them into silly fridge magnets. Laminate the photos, then glue on a magnet back or use self-adhesive magnetic sheets cut to fit. You can use these individually to pin up important papers or group them into a funny family photo for a purely decorative touch. You can craft a blizzard of darling snowman faces with a little paint applied to the underside of flat marbles, the kind you put in flower vases. This idea easily adapts to a row of smiley emojis, a swarm of ladybugs or a sinister spider's body (just glue on some pipe-cleaner legs). In the fall when acorns cover the ground, gather them up and hot glue them to round magnets. Then you can use them to add a touch of autumn atmosphere to your house. Try this idea with other found items such as stones, shells and pine cones.